We are surrounded by them. There are everywhere. You can’t hide from them. They will find you anyways. Well, sounds horrific? But don’t worry, we are just talking about an essential part of nearly every language (at least I think so): Prepositions! And as you have found your way to language-easy.org, you want to know more about a special kind of prepositions.Well, yes, I’m just going to say it… German prepositions! Although this topic seems to be rather easy, you have to be conscious about the importance of German prepositions. Logically, they are so important because they give your German a polish – Of course, people could understand you, even if you used them in a wrong way. But in order to speak a really good German, you have to be a master in German prepositions! Whether you want prepare for you next German class about German prepositions or you simply want to renovate your knowledge about German prepositions you’ve once learned – I hope this page will help you to learn and understand the basics and little details of German prepositions! Well, I think there is no sense in translating these lonely words, as probably know them already and as they are not that important when standing there so lonely. But – using them in a sentence – its whole meaning can be changed by one of these small words. Unfortunately, we are talking about German prepositions. And you might have noticed, nothing is easy in the German language. So, where is the problem? Well, st’s the cases in German. So, German prepositions affect the case of the noun that follows them. And, as you all know, we have four different cases of which three are of importance now: Genitive, dative and accusative. Although that saves from thinking about what function the noun is playing in the clause, you are doomed the master them in any case. Simply learn them, there is no way around it. So, let’s start with our first big chapter of the long history of German prepositions: German prepositions of Genitive. So, let’s start with a rather rare case of German prepositions, the prepositions that are followed by genitive. Although this form is not used that frequently, it is still very important. So, here is a list of the most important prepositions that take genitive with them. Well, let me tell you a little fun-fact: Actually, most German don’t use these prepositions followed by genitive. Instead, they use the dative case, although it is grammatically wrong. So, you have to see it from that point of view: Always use these prepositions in the right way! 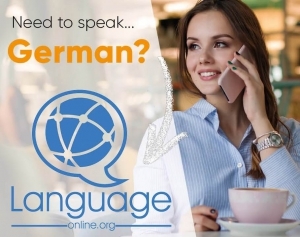 Consequently, people will be impressed by your German, which is even better than the one of mother tongues! Just a short trick I want to tell you – It will help you to improve your spoken German. So, you call it contractions: Obviously, you simply have to put to prepositions together to one single word. So, this can be done in spoken and written German. Well, I can only give you two important advice when learning German prepositions: Just make sure that you learn them together with the case that follows them. So, you can either do that with your vocabulary you learn or forming some sentences where you use these prepositions you want to master. Well, I think we have reached the most difficult part of German prepositions, the so called two-case prepositions. But don’t panic, there is rule you can follow behind all that. So, once you understand this rule, mastering two-case prepositions should be no problem for you. If you’re trying to express movement (direction), use the accusative. 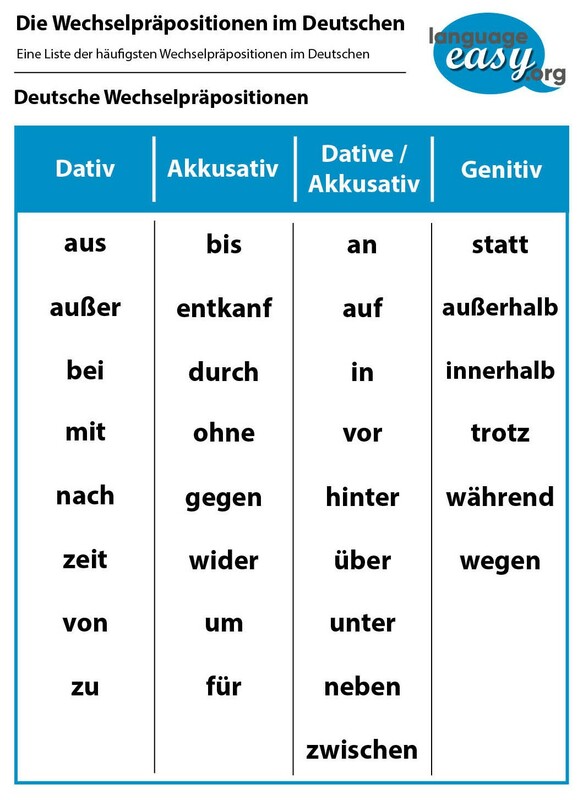 If you’re trying to state where something is (position), use the dative. “Ich lege das Buch auf den Tisch.” (I put the book on the table.) As “auf” expresses the movement, you have to use the accusative case after that. “Das Buch liegt auf dem Tisch.” (The picture is hanging on the wall.) Here, “auf” expresses a position. So, you have to use dative case. In the following, I’d like to present a complete list of German two-case prepositions. an Philip hängt das Bild an die Wand. Jetzt hängt das Bild an der Wand. auf Philip legt das Buch auf den Tisch. Jetzt liegt das Buch auf dem Tisch. hinter Philip stellt sich hinter den Stuhl. Jetzt steht Philip hinter dem Stuhl. in Philip steckt das Geld in die Tasche. Das Geld ist jetzt in der Tasche. neben Philip setzt sich neben Julian. Jetzt sitzt Philip neben ihm. über Er hängt die Lampe über den Tisch. Jetzt hängt sie über den Tisch. vor Philip stellt sich vor das Fenster. Jetzt steht er vor dem Fenster. zwischen Er setzt sich zwischen zwei Frauen. Jetzt sitzt er zwischen ihnen. Unfortunately, well, maybe you will think “Luckily..”, we have come to the end of this article.Finally, I hope, you could get the basic ideas of German prepositions and their different types. Logically, prepositions are like the rest of German grammar – you simply have to sit down on your desktop and study, study study. But if you understand the rules and learn your vocabulary the right way, you will master German preposition without any problems!